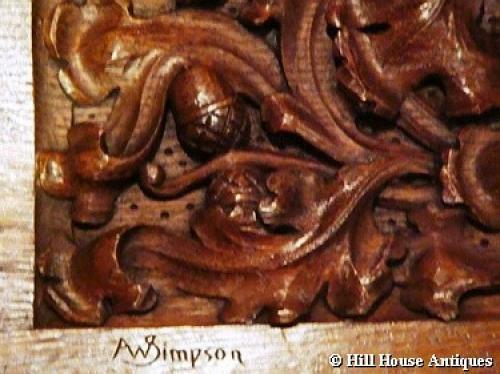 An extremely rare, richly carved wide oak panel by Arthur Simpson of Kendal, and unusually, fully signed in the wood (incised) by him to one end, AW Simpson as well as the place, Kendal, Eng. to the other end; c1890s. A superb example of the quality of his carving at its best; with acorns and other floral and leaf detail, all very much in the manner of William Morris. Possibly a commisioned or exhibition piece. NB: This is a unique & special stand alone work of art; NOT a panel taken out of a piece of furniture. Examples of his carving/work are in Blackwell, the famous Arts & Crafts house in the Lake District designed by MH Baiilie Scott. And of course Arthur Simpson was also very highly regarded by the British architect CFA Voysey (also a personal friend), who commissioned Simpson to make pieces to his designs.